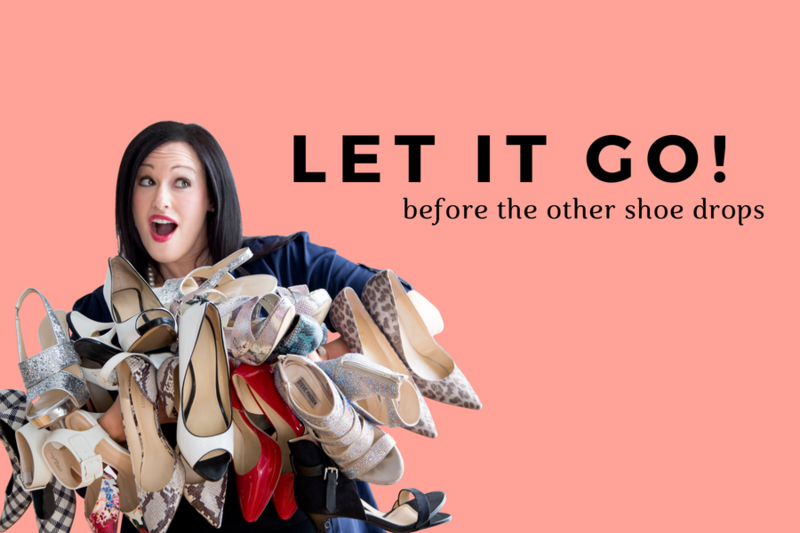 The message is this: LET IT GO! Because the OTHER shoe is dropping my friend, whether you like it or not! Shoes I take VERY seriously. But the rest of life? I don’t take that seriously. I mean, like most things in my life, I’m past the seriousness of most of it! If you choose to take life seriously, that’s your choice. You won’t get out alive! I CHOOSE FUN, laughter and responsibility and above all LIGHTNESS! When you choose your life on purpose, the shoes can drop all around you and usually end up finding that you are OKAY. I used to be the queen of holding on. I still have over 500 (maybe 1000 sq. feet!) of STUFF in my basement in boxes. I’m that person who literally SAVED everything. I love my little treasures. Stuff is one thing to let go of, but getting over the rest of life – the stuff you can’t control – is another. Letting go of the outcome. Letting go of all the outcomes. I know I have work to do on this. And I’m having fun with it. Holding life like a feather. Maybe it’s time to let some things go. I’ve actually made a list. I have a LOT of things I’m going to let go! And the things that I’m ready to let go of WILL create space for some new and exciting opportunities to come in. extra pounds?!? Ya, those can go too! Remember that your cup doesn’t need to be FULL! A cup that is filled to the brim is so full that even one more drop of liquid will make it overflow. Who really wants to live with their cup THAT full and full of STUFF that ain’t good? I mean, why can’t you have a few sips of the good stuff and refill as needed? I’m just saying that sometimes letting go of all the excess to make room for a few very specific things is the way to go. I could probably make T-Shirts out of these sayings. However, don’t you think there’s something so calming and peaceful when you sit around people who aren’t scattered or all over the place. Calm, cool, collected – with room for more. Also, when your energy is scattered, you better believe you won’t be attracting anything good into your life! The money, the relationship, the body, that purse….. all the things that you want will flow easier to you when you are calm and centered – not flailing around with your arms flapping like a duck and squawking all over the place…. you get what I mean. I’ve literally felt like a crazy person out of control. You and God together form a MAJORITY. Why are you still minoring in the minors? Why are you still living like the pauper? Why are you still allowing the crap you don’t want into your life? Why are you still filling your cup with cheap draught beer or bad wine? Why aren’t you letting it go? Could what you are holding on so tightly to be something that’s holding you back from reaching the next level, living your best life? Are you holding onto an outcome? Are you giving your goals a chance to breath? What a world it would be, for you my dear, if you let the people be people, the songs be songs, the no be the no, the yes be the yes and not let it mean anything about you? For you my dear, what if you just took the world as it was: perfect imperfection. What if you just took a deep breath and breathed it all in? PS. Want to increase your sales with total confidence? Check out the FREE Sales Mentality Give Away Party – 15 experts giving your their best sales strategies! Sign up now!